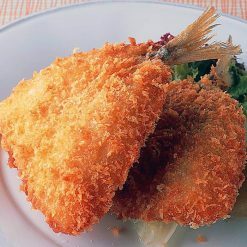 These fried mackerel are individually hand-breaded with panko. The mackerel used for this item have had their backbones, abdomen bones, and scutes removed. Preparing fried foods can be quite messy and time-consuming, and as a result many people avoid making their own at home. However, because this mackerel arrives ready to fry, it can save you a great deal of time and nearly all of the cleanup! Mackerel are one of the best fish for omega-3 acids. A medium-sized serving of mackerel will also take care of nearly an entire day’s recommended intake of vitamin D.
Without defrosting them, fry the mackerel in oil at 170℃ to 180℃ for 3 to 4 minutes, until they are light brown in color. 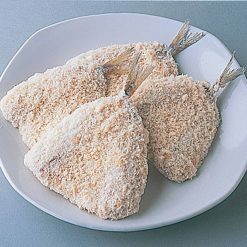 The fried mackerel can be paired with your favorite sauces and eaten as a snack or as a side dish.If there is frost on the mackerel it can cause the hot oil to jump, so please be sure to remove any outer frost before frying. This product contains japanese horse mackerel, coating: panko, potato starch, wheat flour, sugar, table salt, yeast extract. Rate of batter coating: about 42%.. Origin of ingredients: Japanese horse mackerel (China, other). Prepared and packaged in Japan.